Does loom-knitting sound a bit loony? If you clicked here from Blogtoberfest and feel a bit lost, I'd like to share a lil' loomy lingo. Loom knitting is like needle-knitting in the round. But your stitches each have their own peg. Once you learn how to wrap, you can knit, purl and do almost anything you can do with needles. The pegs help keep your stitches even and the loom is easy to hold. Let's talk about the photo below. It's a 41-peg large-gauge loom. So I can knit up to 41 stitches. And the gauge is equivalent to a U.S. 10-13 needle. It's perfect for bulky-extra bulky yarns or I could use thinner yarns for lace work. 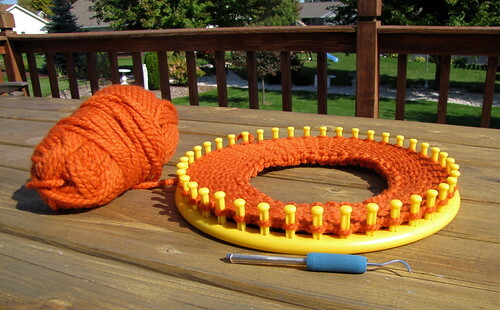 I've connected my knitting in the round to make a hat but you can use just part of the loom to knit a flat piece, too. I am knitting a row and purling the next to create a garter-stitch brim. Next, I'll knit all the rows for stockinette. I hope to show you a few different looms this months as I work on the costumes. I need these costumes in a pinch. So this first hat will be a cinch! But I've been warned it won't keep my ears warm.